Yes, You Can Play Fast! May 18, 2017 January 20, 2019 Graham TippettLeave a Comment on Yes, You Can Play Fast! Following on from the ideas we looked at in How to Crack Your Picking Code and An Alternative Route to Playing Fast, and from watching a lot of Troy Grady videos, it seems there are two distinct kinds of player when it comes to shred guitar and generally playing at warp speed. For the sake of simplicity, we’ll group them into orthodox and unorthodox players. 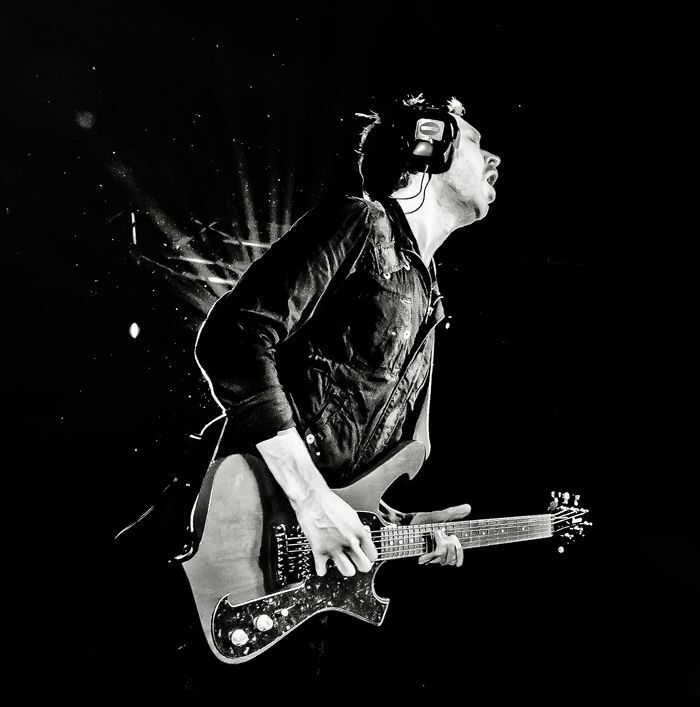 Orthodox players, such as John Petrucci or Paul Gilbert, are those that have an all-encompassing, very disciplined technique designed to handle pretty much anything that’s thrown at it, while unorthodox players are those that, mainly driven by the sound they wanted to create, arrived at their own picking techniques and ways to play fast—these are the players featured in many of Troy’s videos. Unorthodox players are basically those guitarists that have their own, or a non-standard way of playing fast i.e. they’re not using strict alternate picking or flawless economy picking to generate speed. If you watch Troy’s videos on Yngwie Malmsteen and Eric Johnson in particular, you’ll note that neither of them are very aware of the mechanics of what they’re doing, especially Yngwie; Eric is a little more clued in but he’s still at a loss to explain his own technique in great detail. Other players I’d put in this category are Vernon Reid, Allan Holdsworth, Marty Freidman, and even Steve Morse. Orthodox fast players are those that have a very standardized picking technique, be it alternate or economy picking, or some variation on these. These players’ techniques are water-tight, which makes them great session players, or players that can reproduce virtually any written music that’s put in front of them. I would put players like John Petrucci, Guthrie Govan, Steve Lukather, Jason Becker, Frank Gambale and a host of others in this category. It also seems to me that the orthodox technique relies on a certain amount physical strength, but I could be wrong. A lot of guitarists who have tried to play fast but have been unsuccessful put it down to the fact that they weren’t meant to play fast, or their hands and brains aren’t wired for that kind of playing. I used to think the same way, and pretty much dismissed the idea of ever being able to play at warp speeds. This was up until a few years ago when I began to explore the mechanics of fast playing with the help of Troy’s videos, and a lot of trial and error. I was running a pentatonic picking exercise, strictly following the picking pattern while trying to build up speed. I could feel myself getting frustrated and began to deviate slightly from the original picking pattern, just something as simple as changing a downstroke for an upstroke in the sequence. What happened next was mind-blowing: the pattern became ten times easier to play, my hands relaxed, and the notes started coming out at warp speed! It was epiphany, I had found my way to tackle that particular sequence of notes and could repeat it all over the fretboard, and I wasn’t using a standardized picking technique—quite the opposite in fact. The sequence I’d found was effortless to execute, and I immediately recalled Troy showing a clip of Yngwie playing his usual ripping leads on morning TV with consummate ease, while pointing out that he must have had little or no time to warm up due to the time of day. It made sense when I found that I was able to pick up a guitar cold and easily play the sequence I’d discovered. I also recalled one of Dave Kilminster’s classes at music college when he told us that you use the exact same amount of effort to play fast as you do to play slow… and it all made glorious sense. The motion was effortless, and there was me thinking that you had to practice your 16th notes ad nauseam to a metronome (then warm up) before you could even think about executing these kinds of licks. I believe then, that there’s a way for you to play any sequence of notes as fast as you wish; you just have to find the right combination of picking and fretting hand movements by trial and error. What Troy does is interesting because instead of just copping licks off famous shredders, he cops the whole motion mechanic of their picking and fretting hands—quite a feat if you think about it. If you want to pursue this idea, I’d recommend using either your own scale sequences or very generic licks and runs, and even just scales shapes. This is because you probably won’t discover your own picking technique through copping someone else’s licks that were specifically designed for their picking technique, even down to the placement of the actual notes. I’ll admit there’s a lot of trial and error involved, but it goes to show that you CAN play fast!